With the increasingly severe air pollution of nitrogen oxides, government has more strict control on nitrogen oxide emissions from thermal power plants. Denitrification is the main measures for reducing nitrogen oxide emissions. Since 2011, the National Development and Reform Commission, the Ministry of Environmental Protection and local governments have all introduced relevant promotion policies and measures.The domestic power plant flue gas denitrification project was vigorously promoted; our company actively participated in the construction projects of the thermal power plant. Such as Datang Techonolgy project, Guodian Longyuan Environmental Protection project ,Huadian Qingdao Environmental Protection Technology Co., Ltd. 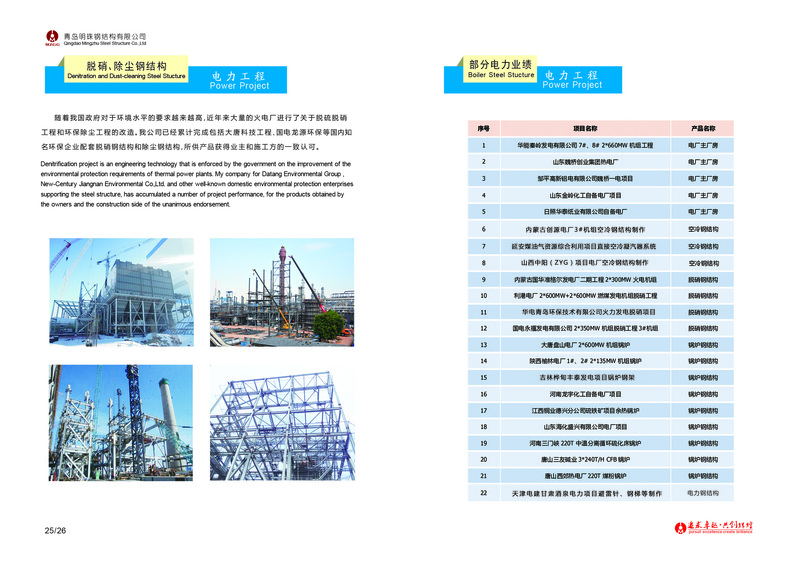 Thermal Power Denitrification Project,Ligang Power Plant 2*600MW+2*600MW Coal-Fired Unit Denitrification Project,Guodian Yongfu Power Generation Co., Ltd. 2*350MW unit denitrification project 3# unit,Tianjin Power Construction Gansu Jiuquan Power Project Steel Structure etc.